We started trying to get pregnant in early 2004 while living in Brisbane. About 8 months had gone by with no success. Around this time, we took up an employment opportunity to move to Bundaberg. Once settled, we again started trying again for about 6 months, but still could not fall pregnant. So, we decided it was time to start looking into why nothing was happening. I was referred to a Gynecologist and tests were carried out (scans, ultrasounds, and blood tests). The results showed that I wasn’t ovulating, so I was started on clomid, which is a fertility drug to help stimulate ovulation. After the results of my tests came in, my doctor diagnosed me with having Polycystic Ovaries (PCOS). Well into 2005, we were still having no luck and the gynecologist treating me had decided to retire. He referred us to a new specialist who carried out his own tests including a laparoscopy, where he found a small amount of endometriosis. He did not agree that PCOS was the reason for my infertility, but he was still not 100% sure what the reason was, so it was put down to “Unknown Infertility.” With no conclusion, we kept going on the same medications, temperature charting, ovulation, and bloods. Finally, we were sent to a fertility clinic. The day we had our appointment, we arrived at the office to find it filled with boxes and leaflets everywhere. We were advised they were actually closing down; they would however still carry out our informational interview, but all our records would be sent to their second office on the Sunshine Coast. Things were just not going our way, but we decided our only option was to drive back and forth from Bundaberg to the Sunshine Coast for treatment. Fortunately, about 3 months later another employment opportunity arose and we were lucky enough to relocate to the Sunshine Coast. It was going on a good 2.5 years now and everything was getting a little frustrating, so we made contact straight away with the clinic that had our records. No more tests were performed – they just used the medical history they had: continuing the use of the clomid, introducing FSH injections and progestrogene. Over the next 12 months, we had three tries at AI (Artificial Insemination) with all being unsuccessful, so we made the decision to go further into IVF (In Vitro Fertilization). I went in and had some eggs collected. Five were retrieved, but during fertilization only 3 survived. We placed our first embryo back in and two weeks later, to our surprise, we were pregnant and very excited. The 6 week scan went well, but when we returned to have our 10 week scan it was found there was no heart beat. It seems the embryo had not progressed from about week 7. Not only was this sad in itself, but the demonstration of what the foetus should look like at this stage could only be described as a bad chicken dance with the doctor flapping his arms and the verbal explanation along the lines of “It looks like nothing has grown since about week 7. By now we should see a little foetus with some arm shapes flapping!” When the doctor noticed I was crying, he added “Oh, you’re crying, it is sad, would you like a tissue?” The bed manner was just lacking! I was booked into hospital that evening and a curette was performed. It was all over and we were devastated. We continued on the same track of still not knowing why I couldn’t get pregnant. I continued on the medication and the 2nd embryo was implanted about 5 months later. It didn’t take. With only 1 embryo left, we were starting to feel quite negative, and unfortunately the personal touch seemed to have been lost. We felt we were just another number at the clinic and they were more interested in our money than helping us fulfill our dream of becoming parents. We had our last embryo implanted a couple of months later with great hope it would be positive, but it was not to be. Coming up to 4 years with no real diagnosis and no success, we were all finished. We had to make the decision to start from scratch. Whilst on holidays in March 2008, I happened to meet a girl through a friend who also had been having fertility treatment. I was amazed listening to what treatments she had tried in only 6-12 months compared to everything we had been doing in 4 years. We were way behind the 8-ball. Arriving home, we had to decide whether to stay with our original clinic or make a change. This was quite difficult because you felt you were being disloyal, but at the same time we were not happy. We decided to meet with the ladies at Fertility Solutions. Our first meeting was with a nurse who read through our medical history. We talked over all my symptoms, test results, and what we had been trying medication and procedure-wise. In the end, the original diagnosis of having PCOS made sense to be the cause of my fertility issue. The nurse then went on to explain how the clinic worked and what was involved with us going forward. On leaving, we both felt the right decision had been made, feeling more positive then we had in months and how lovely the ladies were. It just felt right. Getting a referral to a doctor at Fertility Solutions, we started again. Now, we had a firm diagnosis to work with, so I was put on Metformin, a medication that slows down the insulin the body creates (diabetics use this also) which produces the cysts. I was also put on Lucrin & Gonal F injections and progesterone before going straight into full IVF, as we were starting fresh. We tried artificial insemination 3 more times, again with no success. It was time to have some more eggs collected, so we went through the process of getting my body ready and went into hospital on the 5th October 2009. Twelve eggs were removed and 11 fertilized. We were amazed, considering the low amount we produced originally. On the 7th October, we had our 1st embryo placed back inside. The 2 week wait to find out the result always takes so long, but this time it sadly went very quickly due to an unexpected family tragedy that occurred. We felt for sure it would have a negative impact on my pregnancy. When the time came for my blood test, it was a long, agonizing wait for the results to come the next day. But the phone rang and we were given the best news: It was POSITIVE. The tears came and we were overjoyed with emotion. For the next 16 weeks, we just felt like we were holding our breath. Our early scans went well and we found ourselves closing our eyes until we either heard the heart beat or the doctor said all looks good. I did have some morning sickness, but I think I made myself sicker then I was going to be. I knew/hoped I was still pregnant, along with doing 3 more home pregnancy tests just to make sure it was real. Then we finally made it to the “safe period”. Throughout my pregnancy I was very lucky, suffering no health issues or problems at all, I loved being pregnant and having the round belly. My due date was the 28th June 2010. Getting to week 37, I began to think, “anytime now.” Having read many stories on IVF pregnancies, it appeared lots of women gave birth early at around this time. So I waited through weeks 37, 38, and 39 with our baby being a no show. We got to week 40, still intact. It was safe to continue to 42 weeks, but I started to get a bit anxious, so we decided to be induced at week 41. We went into hospital on the morning of the 5th July 2010 and a feotal monitor was put around my stomach. My doctor came in around 8.30am and did an examination. It seemed that nothing was ready: My cervix had not started to dilate or soften in any way, shape or form. He inserted the prostaglandin gel and the general consensus was he would be back at lunch time to apply a second dose. Due to having no signs of being ready, all the midwives believed we would be there for some time – probably not giving birth until Tuesday. However, to everyone’s surprise, my contractions started about 11.30am. They came on pretty strong and my water broke around 2.30pm, so we moved into the birthing suit. The monitoring was constant. I went from sitting and leaning on the bed and chairs to spending many hours squatting in the bath. I started to think it was never going to happen, but kept pushing and breathing. About 6pm, more of my water broke, so they had not completely broken earlier. It was just after 7pm when our wonderful midwife suggested I hop out of the bath, so she could give me an examination to see how things were coming along. I got onto the bed and lay on my back. Within minutes, I had 3 fast, very strong contractions. Now it was happening; I crowned. The midwife went to call my doctor. On her return, I remember her saying, “Ok stop pushing,” but her next words were, “It doesn’t matter, here is your baby,” and with that our precious little bundle was placed on my chest. I missed my gas opportunity. It was all over with no drugs and all within hours from start to finish. (I think next time though I will be trying more positions instead of getting fixated on one thought.) Those beautiful little eyes and frown looked up at us and we were just amazed and a little shocked. Our doctor came in minutes later. Missing it all, he asked what we had, realizing none of us had even thought to look, as it just didn’t matter. 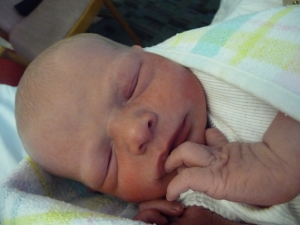 He then announced we had a beautiful little boy. We were both checked and he was just perfect, I had minimal tearing with 4 stitches. All in all, my birthing experience was amazing. Having Max makes everything we had been through worth every second, cent and much, much more. I really believe if we had not made the decision to change our situation, our long awaited day may have never arrived. My piece of advice for anyone if you are facing such a choice, really think what is best for yourself, not others. 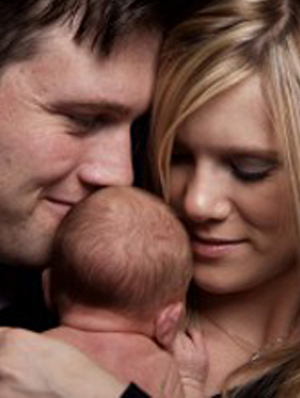 We could not recommend the IVF team enough for their professionalism, empathy, and dedication. They made a difficult and emotional journey a lot easier.